Hello my gorgeous followers! I just wanted to share with you a quick post about my Valentines day (if you're interested). This is a picture of my boyfriend, Grant and I. 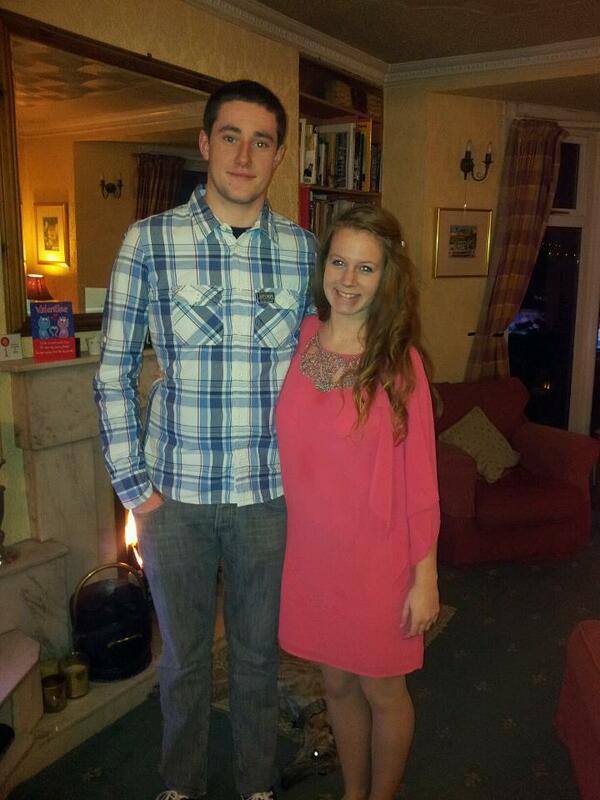 His shirt is from Superdry and my dress was a handpicked Christmas present from him, from Lipsy- I'm so lucky! We went to ASK in town and had a lovely meal, unfortunately we only had two hours or so together because my man had work in the morning, but it was still amazing! I woke up on Tuesday and found that a huge box had been delivered for me! Turns out I had received my first sent flowers to the door- half a dozen pink (my favorite colour) roses! So here they are on my desk! Also, before we went out, he gave me another present! A Lush Valentines Gift set which I have been going on about because I just think they are so adorable and the packaging is to die for! 1. It's Raining Men- Shower and hair gel. This is my new favorite sent from Lush. The gel is thick and honey scented, it feels luxurious and a little always goes a long way from these bottles! Can't get enough of this scent! This massage bar smells identical too Honey I Washed The Kids, which I love, so if you're like me, I urge you to buy this! It's quite pricey but the smell is to die for! It smells like honey and toffee covered caramel candies with chocolates in the middle. So YUMMY! The only thing is, this massage bar seems to take so much longer to warm up and use. This limited edition soap is definitely not too miss! It's very creamy and feels gorgeous on the skin. It also leaves a long lasting scent, which I think is important. It is “a sensual blend of jasmine, mandarin and vanilla to gently inflame the passions and get things moving in the right direction.” – very suitable for Valentines Day or any romantic night! This is like a perfume that leaves you sparkling and silky! Grated cocoa butter melts onto the skin for a silky sensation and the powders don't make your skin feel greasy. The scent is jasmine and vetiver. The name is perfect for the smell, it's very sensual and seductive- perfect for a night in with the other half! I really couldn't ask for a better guy, even if there was such thing! Yes it is my middle name! I'm guessing it's your last? Oh my gosh! I love LUSH!